Lock in a great price for Shearwater's Explorers Village – rated 8.8 by recent guests! We had a great stay here with our 2 yo child. Staff were very considerate of her needs and made us very comfortable. Delicious food and good facility. Excellent location from which you can walk to town or the park. Staff were all friendly and helpful. Chalet rooms were clean and comfortable, just big enough for two. Staff was superb. We stayed in the preset tents which were nice and you had all the amenities of the lodge. Location to local restaurants (Brewery!) was easily walkable. Great place to stay! It was very centrally situated, the staff were very helpful and friendly. My requests were attended to promptly. 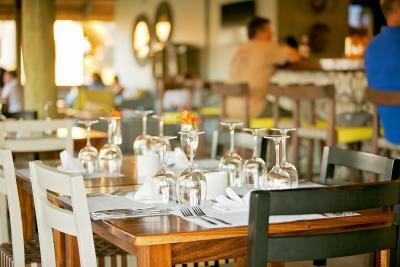 The dining and pool area were attractively decorated and the meals were delicious and very well priced. The rooms were a bit small but very adequate. Very clean with comfortable beds. Excellent rooms! Very clean and new feeling! The Shower was nice and warm. Excellent breakfast! Nice pool. Cold AC in the room. Very close to restaurants and the falls. Staff very helpful with booking tours. Lovely property! I will say the highlight of this tent village was the breakfast! The fresh fruit, yogurt, granola with nut mix and breads with the delicious rooibos tea was phenomenal. The servers were very attentive. Super friendly staff, especially Victor. He’s awesome. The rooms were very nice with a good amount of space and great A/C. The hotel is really close to the town center (about a 5-10 minute walk) and really close to Three Monkeys and the brewery. The breakfast selection is pretty good too - I recommend the bream. Beautiful place and lovely staff. The food was delicious too. One of our best sellers in Victoria Falls! Shearwater's Explorers Village is located in Victoria Falls and has accommodations with an outdoor swimming pool and free WiFi, a 2-minute walk from Elephant's Walk Shopping & Artist Village and one mile from David Livingstone Statue. Some units include a seating area and/or a terrace. A buffet breakfast is served at the property. 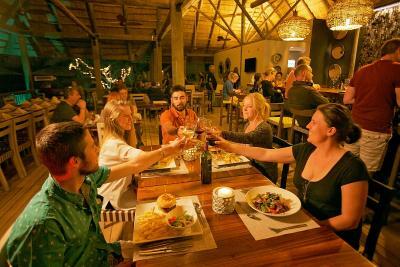 At the lodge you'll find a restaurant serving International cuisine. A bicycle rental service is available at Shearwater's Explorers Village. The Big Tree at Victoria Falls is 1.6 miles from the accommodation, while Victoria Falls Crocodile Park is 3.3 miles away. This property is also rated for the best value in Victoria Falls! Guests are getting more for their money when compared to other properties in this city. When would you like to stay at Shearwater's Explorers Village? This tent features a seating area. House Rules Shearwater's Explorers Village takes special requests – add in the next step! Up to two children under 12 years are charged USD 45 per night when using existing beds. All children under 12 years are charged USD 45 per night for extra beds. Any additional older children or adults are charged USD 60 per night for extra beds. Shearwater&#39;s Explorers Village accepts these cards and reserves the right to temporarily hold an amount prior to arrival. Shearwater's Explorers Village accepts these cards and reserves the right to temporarily hold an amount prior to arrival. The tents in the communal area are very close to each other with no cooling facilities other than the fans around the bar area. It would be nice to have a washing area to hang wet items of clothing. Pool is a lot smaller than portrayed in the images. Location was excellent with proximity to Victoria Falls. The general cleanliness was very good and our belongings, as well as general saftey, felt very secure. Complimentary mosquito spray at the bar was a nice touch. The communication prior to arrival was "top draw". The establishment was perfect for our requirements. The staff were prepared to go the extra mile, with a friendly smile. The evening restaurant menu and quality of meals were excellent. Lovely breakfast every day. The staff are excellent. The lack of refrigerators for clients within the rooms. It was a struggle to get one in the kitchen. The rooms were excellent and the location is great. Staff and restaurant area and food was good. Staff were very friendly. The room was clean. Wifi worked perfectly throughout my stay. Great service. Perfect location, walking distance to the falls. The tents..really..it's like being slow roasted alive whilst being eaten by mosquitoes. No outside space to sit and the tents are literally one on top of the other for $35. Wow! After a night in the tents I upgraded to a room. What a difference! It was expensive but the rooms are of a very high standard and beautifully done. Just don't stay in the tents. Packed together, and often a tour group very close by with big trucks parked outside the tents. The tents are under a corrugated and wooden roof and are like ovens placed on concrete with no outside space to sit. Lots of mosquitoes. Very expensive at $35. Stay in a room or move on! The prices at the bar were on the high site. They were using a high exchange Dollar/ local currency. Personnel was very helpful and polite! Clean/ beautyfull Palace !! !